Imagine you have a clock. Not a digital clock. One of those old fashioned clocks with two hands. Let’s try something. Make the clock show high noon, so that both hands are pointing at 12. Now pin down down the hour hand so it can’t move. (Or if you want, pin down the minute hand. Either one, it doesn’t matter). Now we’re going to slowly sweep it through one whole rotation: 360 degrees. At 4 o’clock you’ve swept it through 120 degrees. At 6pm the angle is 180 degrees. Then we get back to midnight: 360 degrees. Here’s where chemistry comes in. Let’s say you’ve got a simple molecule like butane. 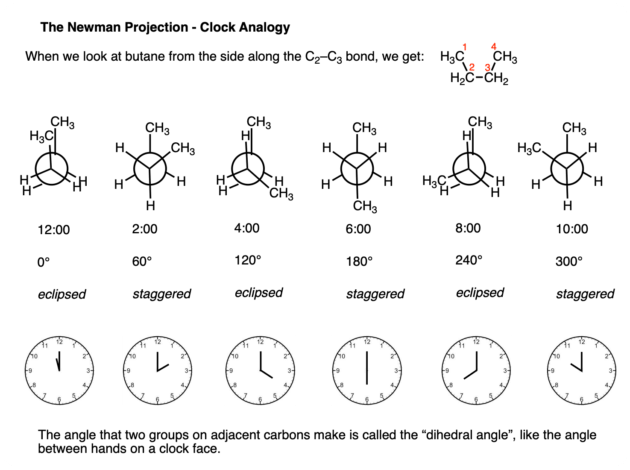 If you look at the C2-C3 bond end-on, it’s a bit like looking at a clock face – if you imagine the methyl groups as the minute and hour hands. That angle between the two methyl groups is like the angle between the hands of a clock. We call this angle the “dihedral angle”. That circle with all the groups pointing out of it also looks a bit like a clock . This is called a Newman Projection. It’s a useful tool for visualizing these rotations. So what? you might ask. In another tip, I’ll show you how to apply this. PS – it’s actually arbitrary which group you choose as the “minute hand” and which you choose as the “hour hand”, so long as they are on adjacent carbons. For butane we usually choose the two methyl groups because they’re unique. But as long as you’re consistent. you’ll get the same result no matter what two groups you choose.